Import­ing from the media card to a hard disk would be the first essen­tial step. Espe­cial­ly when you will be work­ing on sev­er­al media cards, import­ing it to a hard dri­ve attached to your com­put­er would make orga­niz­ing and sort­ing much more eas­i­er. 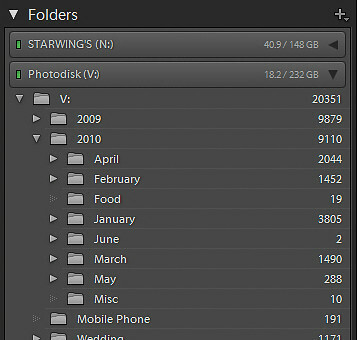 I employ a sys­tem where I group all my pic­tures based on dates and shoots. This way, it makes search­ing for a par­tic­u­lar pho­to from a par­tic­u­lar event much more eas­i­er. Dur­ing import, I also apply a pre­set Meta­da­ta and key­words dur­ing import. I also some­times pre­fer to set Ren­der Pre­views to 1:1 to ease the load­ing time dur­ing sort. Due to the nature of my work, I some­times shoot with up to three cam­era bod­ies. This is essen­tial espe­cial­ly to cap­ture the crit­i­cal moments with­out wast­ing that split sec­ond chang­ing lens­es. On the cam­era body, both the time and date is syn­chro­nized to the sec­ond. In Light­room, the images are arranged based on cap­ture time. Before any­thing else, I quick­ly scroll through the images that I have import­ed and delete any images that are obvi­ous­ly mis­takes. In Grid mode, the ones that are sol­id black, or shots that I have acci­dent­ly took are removed. Medias are so inex­pen­sive nowa­days that I just flag them as Reject (X on the key­board) with­out actu­al­ly delet­ing them. I cre­ate a col­lec­tion set for a more com­plex shoot, like a wed­ding for exam­ple. Now that the bad ones are out of the way, I Select All (Ctrl + N on PC, Com­mand + N on Mac) and put all the pho­tos into a Col­lec­tion. I make this Col­lec­tion as part the Col­lec­tion Set that I have cre­at­ed. Look­ing at thumb­nails can be deceiv­ing. For this, I enlarge the size to fill my screen (Space­bar on the key­board, or dou­ble click with the mouse). I press Shift + Tab to hide all the pan­els, and L twice for “Light Out”. This puts the pho­to at the cen­ter of the screen with a black back­ground around my pho­to. I also press F twice to tog­gle full screen mode. I use the left-right key on my key­board (or tablet if you have con­fig­ured it) to mark the pho­tos that I have missed when look­ing at thumb­nails. I usu­al­ly use the ‘Pass’ (P on key­board) to select the win­ners. 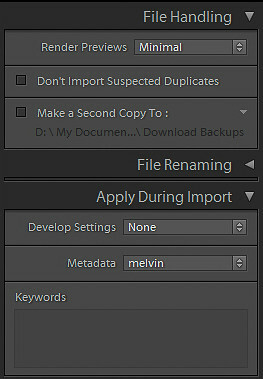 Using Adobe Pho­to­shop Light­room fil­ter­ing sys­tem, I turn on the fil­ter to show only the ones that I have marked. I put these into a Col­lec­tion which I named ‘Picks’ into the Col­lec­tion Set. Once I am hap­py with what I have select­ed, I start on by work­ing on the pho­tos. By this time, I dis­abled the ‘Light Out’ mode so that my pan­els are vis­i­ble. I work entire­ly on Devel­op mod­ule as it is eas­i­er to gauge by look­ing at the val­ues and slid­ers. Dur­ing this process, I crop, adjust the col­ors, White Bal­ance, Expo­sure and High­lights. I also apply Noise Reduc­tion and Lens Cor­rec­tion when nec­es­sary. Great info there, Melvin! Very infor­ma­tive! 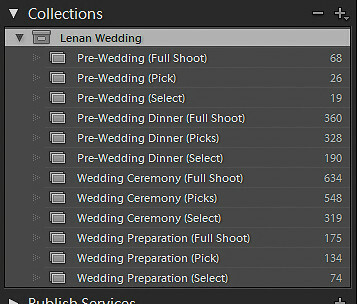 Now i know how to man­age the pics I shot. Does Light­room come at a price? Adobe Pho­to­shop Light­room is retail­ing at USD299 avail­able for Mac and Win­dows.